Osquery is an open source operating system instrumentation, monitoring, and analytics. Created by Facebook, it exposes an operating system as a high-performance relational database that can be queried using SQL-based queries. Osquery is a multi-platform software, can be installed on Linux, Windows, MacOS, and FreeBSD. It allows us to explore all of those operating systems' profile, performance, security checking etc, using SQL-based queries. In this tutorial, we will show you how to setup File Integrity Monitoring (FIM) using osquery. We will be using the Linux operating systems Ubuntu 18.04 and CentOS 7. Osquery provides its own repository for all platform installation, and the first step we are going to do is installing the osquery package FROM the official osquery repository. Add the osquery key to the system. Add the osquery repository and install the package. 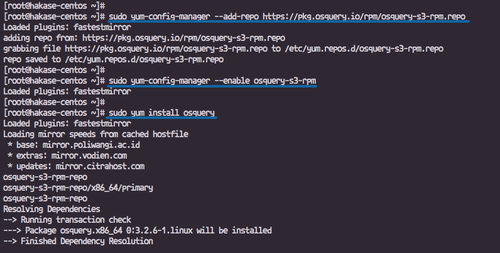 Add and enable the osquery repository, and install the package. If you get the error about the yum-config-manager command. Osquery provides features to read or consume system logs on the Apple MacOS using the Apple System Log (ASL), and for Linux is using the syslog. In this step, we will enable the syslog consumption for osquery through the rsyslog. Install the rsyslog package using the apt command below. Install the rsyslog package using the yum command below. After the installation is complete, go to the '/etc/rsyslog.d' directory and create a new configuration file osquery.conf. osquery default configuration is 'osquery.conf', usually located in the '/etc/osquery' directory. There are samples of the osquery configuration '/usr/share/osquery/osquery.conf' and sample of osquery packs configuration. In this step, we will learn about the osquery configuration components, create the custom osquery configuration, and then deploy the osqueryd as a service. osquery configuration formatted as a JSON file contains osquery configuration specifications described below. Options: part of the osqueryd CLI command and it determines the apps start and initialization. Schedule: Define flow of the scheduled query names to the query details. Decorators: Used to add additional "decorations" to results and snapshot logs. Packs: a group of the schedule queries. More: File Path, YARA, Prometheus, Views, EC2, Chef Configuration. Go to the '/etc/osquery' directory and create a new custom configuration 'osquery.conf'. Paste the following configurations there. We're using the 'filesystem' as a config and logger plugins. Define the logger path to the '/var/log/osquery' directory. Enable the syslog pip to the '/var/syslog/syslog_pipe' file. On the scheduler, we define three queries for checking the crontab, system info, and ssh login. Enable the osquery packs named 'osquery-monitoring', and packs files located at the '/usr/share/osquery/packs' directory. Now start the osqueryd daemon service and enable it to launch every time at system boot. And restart the rsyslog service. Basic configuration osquery has been completed. Osquery provides File Integrity Monitoring on Linux and MacOS Darwin using the inotify and FSEvents. Simply, it monitors and detects any changes of files on the defined directory using the 'file_path'and then store all activity to the file_events table. In this step, we will configure osquery to monitor important directories such as home, ssh directory, etc, tmp, and the www web root directory using custom FIM packs. Go to the '/usr/share/osquery/packs' directory and create a new packs configuration file 'fim.conf'. Now back to the '/etc/osquery' configuration directory and edit the osquery.conf file. Add the File Integrity Monitoring packs configuration inside the 'packs' section. Save and exit, then restart the osqueryd service. Keep checking the JSON configuration file using the JSON linter 'http://jsonlint.com/' and make sure there is no error. We will test the File Integrity Monitoring packs by creating a new file on the defined directory 'home' and 'www'. Go to the '/var/www/' directory and create a new file named 'howtoforge.md'. Go to the '/home/youruser/' directory and create a new file named 'hakase-labs.md'. Now we will check all logs monitoring using the real-time interactive mode osqueryi and the logs of the osquery results. Run the osqueryi command below. Now check all logs about file changes in the 'file_events' table. For the 'www' web root directory. Go to the '/var/log/osquery' directory and you will get the 'osqueryd.results.log' file. Filter the osquery logs using the 'grep' command. You will see info about those file has been created. The installation and configuration of the File Integrity Monitoring (FIM) on Linux Server Ubuntu and CentOS using osquery has been completed successfully. Nothing returned an error while setting it up and not seeing anything in error logs. Any ideas?